The streets of downtown Wilmington were deserted as we stood in front of the building trying to discern what was written across the old whitewashed brick facade. The light was quickly fading, making the lettering even more difficult to see…. As we entered, the club seemed almost surreal, silent and softly lit by soft neon light. 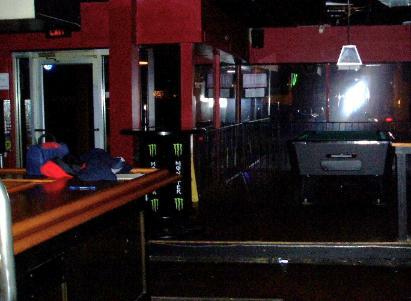 Without the music, the laughter of revelers, or flash of strobes, it was just lifeless empty space. Number 21 S. Front Street has a history all its own dating back for more than two centuries. 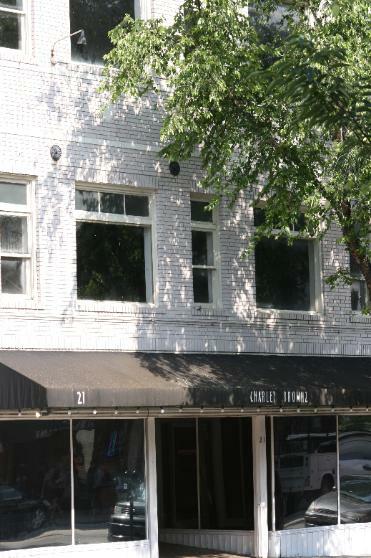 The white brick facade belies the age and history of the building. Outside only large darkly tinted windows face the street, but open the door; and you enter one of the busiest night spots in Wilmington. Neon lights sparkle off lacquered wood and softly illuminate the bottles carefully arranged behind the bar. Modern abstract paintings dress out the dark walls. Small tables await the nights crowd of revelers. On the surface everything appears shiny and polished, But silently underneath the old wooden floors, an old creek stubbornly continues to trickle under the foundation on its ancient path to the river. The first floor is the only area of the building open to the public. Sparkling with polished chrome and mirrors, you can imagine the thump of the music from the large speakers surrounding the dance floor. But venture inside, where hidden just beyond sight and decorated with 10 foot graffiti, are several forbidding back rooms that look like something out of a New York City subway at midnight. In one dimly lit corner, an old and worn wooden staircase leads up to an empty expanse that had remained abandoned for the last 40 years. 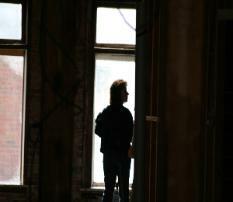 Billy said he has become unnerved by the sounds of footsteps coming from the upper floors. Strange things happen when anyone is alone after closing. Billy is usually the last to leave and the first to return and he was surprised to find the liquor display bottles rearranged with all the labels turned backwards. At first dismissed as a failing memory or maybe a trick by another employee, Billy began to keep track. Night after night, the same bottles were moved or turned each time. One morning Billy found a heavy neon sign was hanging upside down. Billy was dumbfounded,. He explained that it was hung with two hooks and sometime during the wee hours it had to have been taken down and rehung! 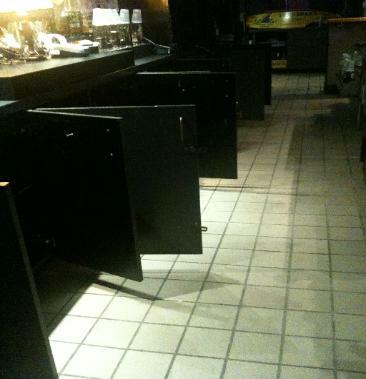 Another time,Billy opened for business and found every cabinet door under the bar hanging open. He was sure he didn’ t leave it that way when he left the night before. More unexplained activity included the staff experiencing cold spots that seemed to move, lights that seem to re position themselves and flicker for no apparent reason. The strange sounds echoing from above have scared the staff, the owner, his wife and young son. Only once did Billy bring his dogs in for a little company while he cleaned. Usually excited and curious, his dogs seemed anxious and would not leave his side. Billy commented:” My dogs are normally intent on exploring and sniffing every inch of the place, but this time, all they wanted to do is leave! Billy shared a story about the actor Brandon Lee. 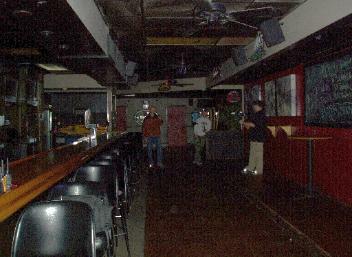 Years ago, Lee had been filming scenes from “The Crow”, using the empty floors above the club as the set for his lair. After a day of filming, Lee returned to CarolCo studios and was accidentally, but fatally shot with a loaded prop gun. This was eerily similar to his fathers untimely demise, not so many years before. 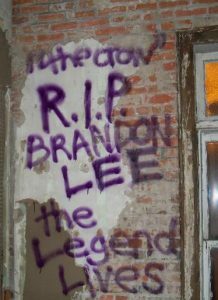 Does the spirit of Brandon Lee remain here long after his premature death? 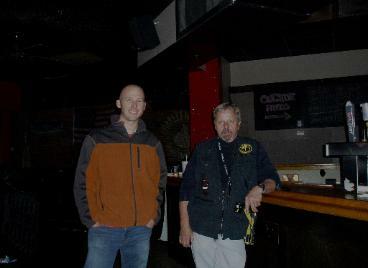 As we walked through the bar discussing the activity and planning our equipment set up, something flew out of the darkness to land at our feet. 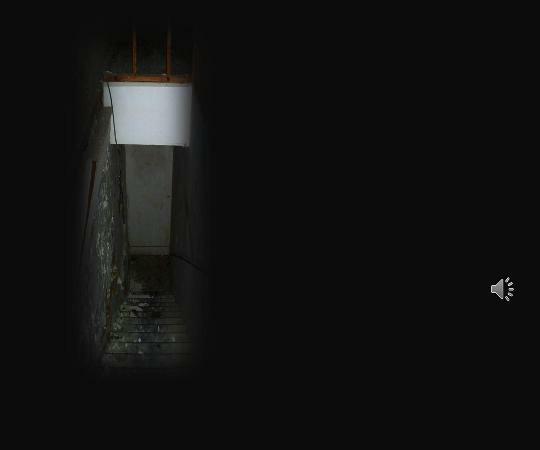 Climbing the well worn stairs to the abandoned floors above, we were not sure if something was watching us from behind, or did it wait ahead in the gloom…. We began our first EVP sessions and search for any natural explanations for the ghostly activity, No matter where we were, the sensation of someone or something was just out of sight, but we were well within it’s reach, whatever it was… Faint whispers, so close you could feel cold breath caress your skin. The phantom presence seemed to follow us, nothing more than a cold chill standing beside us. In reality, no one was there… But as I turned to look back, we recorded a voice not our own. The energy was high making our skin tingle like static electricity. Were EMF ( Electromagnetic Field) the cause? 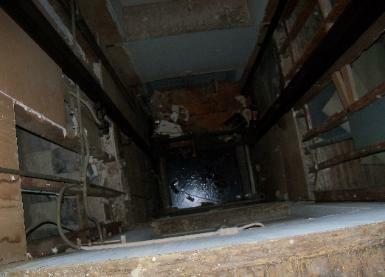 No, the upper floors had no functioning electrical power, and haven’t for close to 50 years. We were sure that something stalked us in the darkness, but the spirits were reluctant to give us a definite sign of their presence. A few hours into our vigil we were startled when the alarm system shattered the silence. Billy had turned it off, but now it beeped and flashed demanding our attention. The digital readout flashed multiple areas and some that didn’t exist! We had to get that thing off before the police came ! I fumbled for my phone, asking aloud” where is it ?”. Someone knew where to look and said so! After some direction from Billy, we eventually silenced the alarm, only to have it resume it’s craziness a few minutes later…. Eventually, the alarm gave up on it’s own. 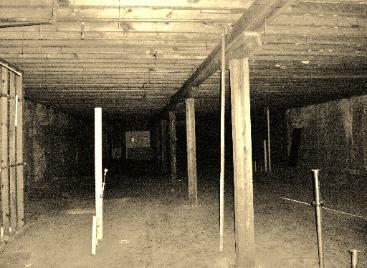 In the renewed silence, the ominous sound of something heavy being dragged across the old planks above was recorded. As the night wore on, the intense force we had originally observed began to fade. 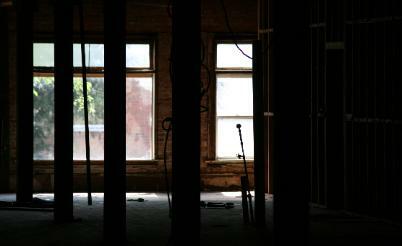 The eerie presence hidden in the shadows had vanished and we were now alone in the dusty abandoned upper floors.Returning to the lounge area, we attempted to evoke communication using white noise. As evidence gained in this method can be questionable, we also did another session with out adding electronic noise. Soon we lapsed into general conversation. At Charley Brownz, the spirits would rather comment on what we were chatting about than answering direct questions! No investigation can be complete without looking back into the local; history.If there is a ghost here, where did it come from? Who is it, and why are they still here? 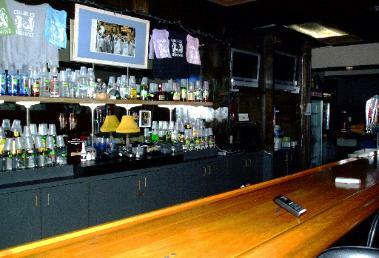 Charlie Brownz Downtown Lounge is a private club located in Haunted Wilmington, part of the Haunted Cape Fear area. 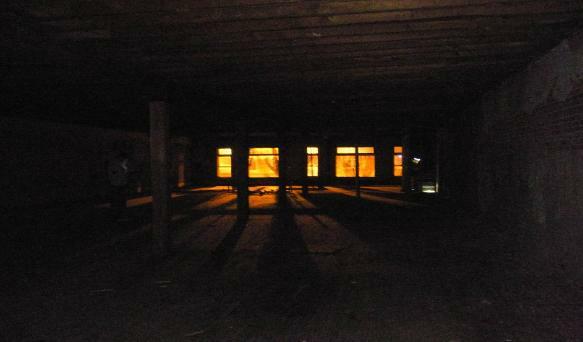 Like the research, no investigation is final until all the evidence has been carefully reviewed and every effort has been made to find any natural explanation for the phenomena….. Not quite as exciting as the historical research, the long hours spent reviewing audio and video are necessary to find the truth behind any suspected haunting. Watching static video can be the most boring and sometimes a fruitless part of the review process, But this is Charley Brownz Downtown Lounge, a very different sort of place! 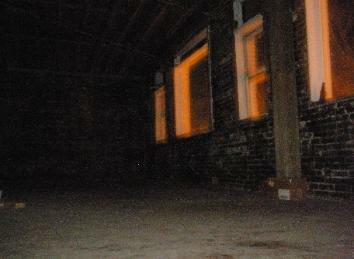 With the evidence we obtained from our EVP sessions, we are able to state that the club is haunted. We heard many voices, some that answered our questions directly, some with snide comments, and others that made no sense. Those may be from residual energy spilling over from another past event. 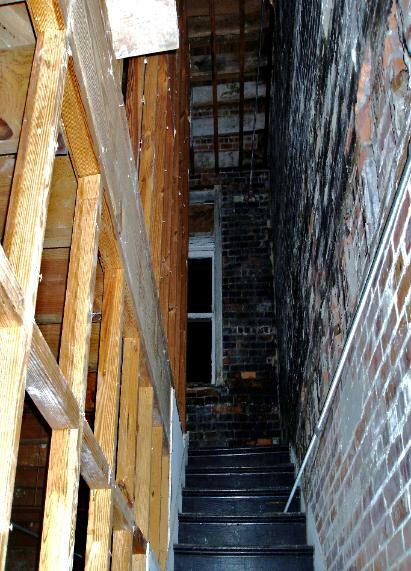 We suspect some patrons from a long forgotten saloon may have strayed over to this property in Haunted Wilmington. darkness so not to be seen. At one time during our vigil, there appears to be one extra person with the team. Perhaps a very curious spirit… See for yourself…. Who Haunts Charlie Brownz Downtown Lounge? We have heard voices and seen the shadows. Could it be the ghost of Brandon Lee ( The Crow), or someone a bit less famous? Perhaps Joshua,local Gunsmith, or Miss Maggie Abraham, still walk the old wooden floors. Mr. Leon Todd (1896-1978) invested his entire life to the sale of furniture, learning his craft from another Wilmington furniture merchant, and eventually teaching his sons the business.Today, 21 S. Front Street is still “TODDs”. Certainly, this building was Leon Todd’s crowning achievement, being a fitting monument for a successful business man and fine furniture purveyor. Maybe Mr.Todd still watches over his grand establishment. We may never find who’s spirit is responsible for the unexplained activity, but we will return and ask for more answers. As we packed to leave, and the boys argued the merits of a good whiskey, Someone with an old Scottish brogue had to have the last word! Please use good ear phones and lower base to listen. The City of Wilmington was founded in 1739, and made its name as an international port and cosmopolitan center. 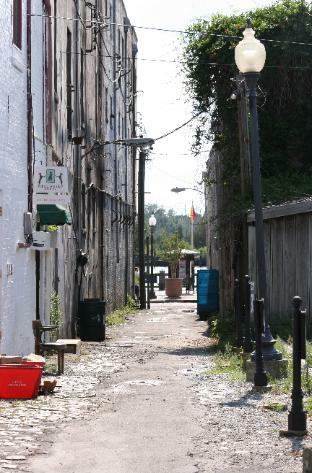 Front Street, one of the oldest streets in the city has seen many changes over the years. North Front St was a warehouse district with quite a notorious reputation, but South Front St. had been a residential area. With the growth of the city, the wealthy moved their homes east toward the knoll where Dr. Bellamy’s mansion still stands. 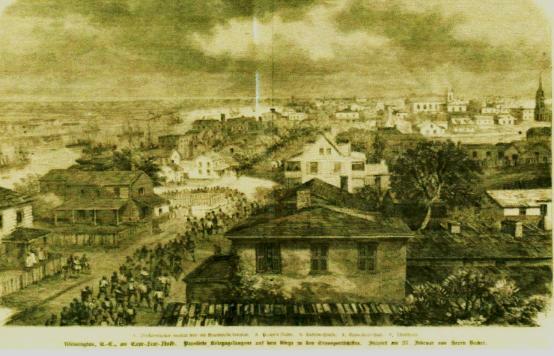 The crowded commerce area on Market expanded both north and south along what were previously only dusty side streets. By 1873, most all of the stately homes on S. Front Street that overlooked the busy river front were gone. Henry Bremmer ran a raucous saloon just around the corner from bustling Market Street. 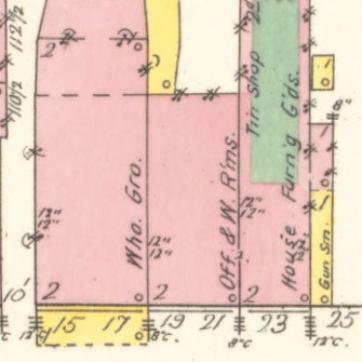 Next door was Sneed & Co., furniture purveyors, followed by Parkers General Store (a green grocer), B&S Tin shop (#21 1/2), a second grocery, a tailor shop and a jeweler. Further, down the block we would have found J.S. Higby’s Crockery. emporium. Somewhere tucked in between these big establishments, Joshua Craig worked as a gunsmith. Unfortunately, Joshua accidentally shot himself and no more was written about him after that date. Circa 1915, just above the Sterling furniture shop on #21 Front St, lived Mrs. Maggie Abraham. By 1920 , Front Street had finally been paved by the Belgian Brick and Block Co. And #21 was the location of Rabey Storage Battery Co. The lot known as #21 S. Front remained empty and abandoned for over 10 years until a new three level furniture store and warehouse was erected by Mr. Leon Todd in 1938. Further research into the property has revealed no written record of other deaths in the years this land has been in use. Plenty of accidents and fires, but if there is a ghost here, who could it be? Leon Todd was born August 11Th 1896 to Wm. M. Todd and his wife Mary Martha Stanley Todd in North Williams, Columbus, North Carolina. Leon Todd began his career learning the furniture procurement business from W.J.Bradshaw at Bradshaw’s store on Princess St. He stayed with Bradshaw and Co, working in their store (128 Front Street) for almost 10 years then struck out on his own. 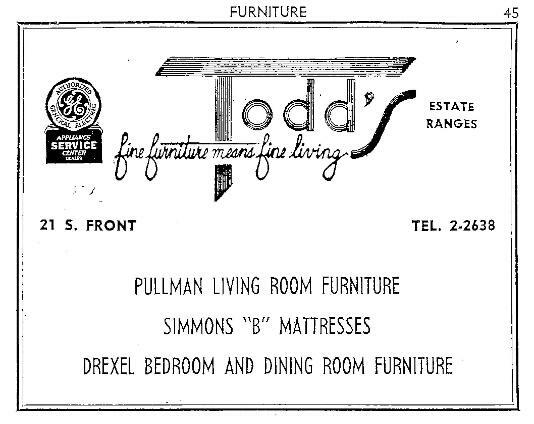 Todd established his first furniture store on 18 S. Front St in 1929. Together, with his wife Kathryn as bookkeeper, the business prospered. Finally, in 1939, Mr. Todd built his dream store on the vacant lot right across the street at #21 S. Front. This new “TODDS” was spacious and had a large modern elevator to make use of all three levels. The main show room on the first floor was filled with the latest and Pullman Living Room Furniture. The huge second floor had individual show cases for the Drexel Bedroom and Dining room sets and a smaller section to display his Simmons ”B” mattresses. 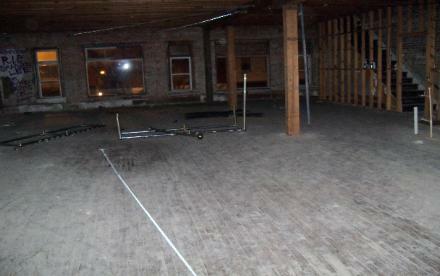 The building’s third floor was a warehouse and repair shop. Leon Todd ran the store until he retired and allowed his sons to take over the business in the early fifties. Apparently unhappy with retirement Leon opened another furniture store ;Lynn’s Furniture(named after his wife) in competition with his sons at TODDS! Lynn’s furniture only lasted a few years. After closing Lynns Furniture, Todd never fully retired. 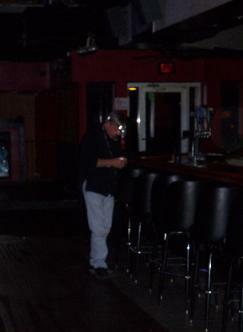 Leon devoted his remaining days to working in “TODDs” until his death at age 81.